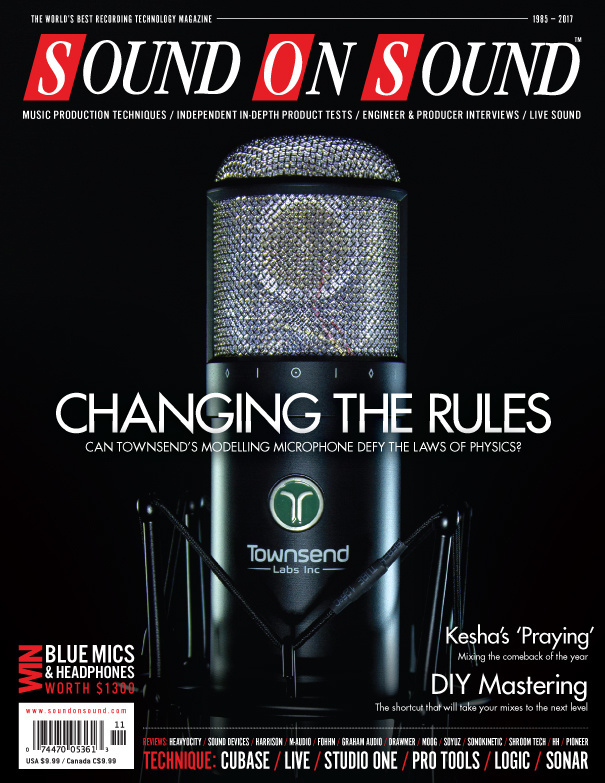 Reviews: Townsend Labs Sphere L22 Microphone (Cover), Sound Devices MixPre-3, Harrison Mixbus 4, Rakit Drum Synth, Pioneer DJ Toraiz AS-1, Drawmer CMC2, Moog Minitaur Rev2.2, Doepfer A110-2 Basic VCO. Techniques: DIY Mastering Made Easy, Zedd: Producing EDM, Inside Track: Kesha ‘Praying’, Behind The Scenes At BBC Radio 3’s In Tune, Library Music: Part 7, The Sampled Orchestra Part 5. Ancient Era Persia focuses on the Middle East, expanding on developer Eduardo Tarilonte’s earlier Desert Winds collection, and includes all four of the wind instruments contained in that library. Audio Damage have started to take a pretty serious interest in iOS, porting a number of their desktop plug-ins to the mobile platform. For 20 years or so the A110 has been the company's basic voltage-controlled oscillator. Aware that there were more possibilities for VCO modules, Doepfer have very helpfully now released three new versions. Here, we take a quick look at the new A110-2. Drawmer’s latest monitor controller puts the same impressive audio quality as their MC2.1 into a new desktop format. Expressive E’s Touché is a hardware controller like no other. The Strum Buddy is a miniature solid-state guitar amp with built-in speaker. The LS6 combines old-school BBC-style monitor design with modern driver technology to deliver a very classy loudspeaker indeed. Harrison’s MixBus promises the sound and user experience of a large-format console, at approximately one-thousandth the price! Heavyocity take a fresh approach to orchestral strings with their Novo instrument. With its 15-inch woofer and flexible on-board DSP, HH’s new powered PA speaker offers a lot of bang for your buck! There are plenty of Kontakt-based virtual instruments using sound engines that blend multiple samples. Luftrum’s take on this approach is Lunaris, which offers the user a source of pad sounds. Have you ever craved the ability to use software plug-ins or MaxMSP patches on stage — without the bother of a computer? Moog’s bovine bass synth just keeps getting better. Pioneer’s new groovebox is a Dave Smith synth in DJ’s clothing. Small company Rakit are making a big noise with their new drum synth. A major update to Rob Papen’s unique reverb plug-in gives it even more creative sound-design potential. Samplecraze have recently refocused their web site around a host of producer and sound-design video tutorials, with Samplecraze’s founder (and SOS contributor) Eddie Bazil at the helm. More keenly priced than many Sound Devices products, the MixPre-3 nonetheless offers exceptional sound quality and functionality. This stylish Russian-made microphone certainly looks the business — but can it compete with the classics? The StompLight takes the leg-work out of stage lighting — by putting the controls at your feet! Townsend Labs’ Sphere L22 boldly goes where no mic emulation system has gone before! Keeping the BBC’s flagship classical music show at the top of its game requires serious engineering skill — and the ability to cope with the unexpected! Vocal perfection means timing correction — and Cubase’s AudioWarp gives you the tools you need. The success of Kesha’s ‘Praying’ justified the lengths that Jon Castelli went to to get the perfect mix — eventually! Pair Track Stacks with Smart Controls to create unique layered instruments in Logic! Cappellino is one of Nashville’s most respected engineers. In this second video, we go behind the scenes and gain unprecedented access to a vocal recording and comping session with singer Heather Bond. Pick up useful tips for speeding through vocal recording while achieving a great result and find out how Neal puts together the perfect take. Bring a new dimension to your Pro Tools mixes by integrating outboard hardware. We examine the creative possibilities of Re-slicing audio in Ableton Live. Create custom kits with Sonar’s Session Drummer 3. Take advantage of Studio One’s versatile modulation features to make your synth parts more expressive. Creative woodwind writing is the orchestral arranger’s secret weapon. German producer Zedd has become a star by bringing musicality to electronic dance music. Will non-AI mixing become the new vintage? Brush up on your listening skills, as we deconstruct some tracks from a production and arrangement perspective. Q. Why choose a condenser mic? Read more about Q. Why choose a condenser mic? Q. Why don’t D-A converters have a word-clock output? I have a very high quality D-A converter that boasts particularly low clock-jitter figures, so I thought it would be an ideal candidate to serve as a master clock — yet it doesn’t have a word-clock output socket! Read more about Q. Why don’t D-A converters have a word-clock output? There’s a lot of money to be made writing music for movie trailers — so you have to be good. Have you got what it takes? Media content for the November 2017 issue.